I think I might be a sponge-a-holic. Never realized it before today, but I write about sponges a lot. It’s just that when I find something I like, I don’t want to keep a secret. So I share my faves here… with you all. Yes, they’re from the Scrub Daddy family, which originally became famous as the most successful deal ever made on Shark Tank. 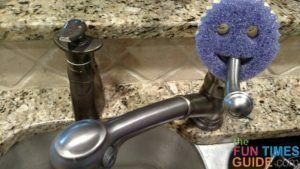 I’ve already written about why I like the Scrub Daddy sponges so much. 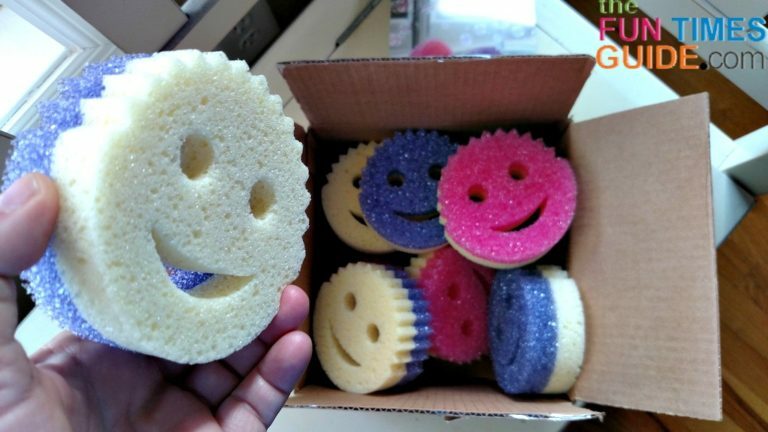 I got the Scrub Mommy smiley face sponges when they were the Today’s Special Value on QVC. For a few months — while the product is still new — QVC is the only place you can buy them. After that, I presume they’ll appear on Amazon and in Bed Bath & Beyond, among other places. 50% of the sponge is a “rough, but non-scratching” surface — like the Scrub Daddy — on one side. 50% of the sponge is a “super-soft, absorbent” surface on the other side — like a traditional sponge. So the Scrub Mommy sponge is the best of both worlds! They don’t get smelly — because they don’t “hold onto” food particles and they air dry quickly. They’re easy to hang (or display) near the kitchen sink. They’re shaped to perfectly fit into glassware, bowls, muffin pans, etc. They fit within the palm of your hand, so they’re easy to scrub with. They don’t scratch any surfaces. #1 – Scrub Mommy is my new favorite kitchen sponge (even better than the original Scrub Daddy sponge) because the soft side makes it possible to actually “clean” the countertop now — rather than simply push crumbs around and scrub the counter (which what the rough side does with ease). You need an absorbent sponge — like the soft side of the Scrub Mommy — to actually absorb liquids and pick up crumbs. This is probably the sponge I will continue to buy for my kitchen, instead of the Scrub Daddy that I have been buying regularly up till now. #2 – I also keep a Scrub Mommy sponge in the shower. I use the rough side to remove hard water stains and soap scum from our glass shower doors effortlessly, and the soft side to wipe the glass dry afterward. Ditto for hard water stains on all chrome surface in the shower. With this simple shower glass cleaning tool, I no longer have to use a bathroom cleaner with chemicals to clean the shower doors. If a sponge alone can cut through hard water soap scum, then you know it’s good! I can’t wait till they come in a color other than pink. Hopefully, they’ll come in bold colors like these.